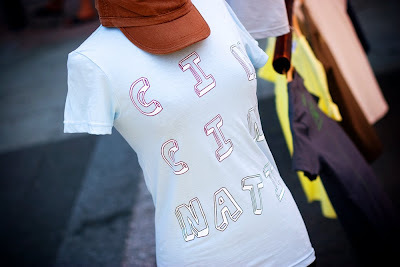 The second Cincinnati T-shirt Festival takes place on Friday, July 17 on Fountain Square from 11am to 11pm, and will feature more than a dozen local vendors and companies. The T-shirt “mini-market” will have offerings from major institutions like the Bengals, Xavier, UC and the Museum Center, but will also feature many local shops and companies like Park+Vine, Nati Evolvement, Alternative Motive (featured on MTV), Wire & Twine and much more. Photo by Chris Glass, to see more of Glass' photos from last year's Cincinnati T-Shirt Festival go here.